Just like working at one of Britain's modern signalling centres, featuring large control areas and authentic route-setting operation. Re-creating busy mechanical signalboxes with large lever frames controlling the signals and points, together with block instruments and bells. Mostly set in the 1950's and 1960's, these simulations recreate the more complex layouts and operating requirements of the day. 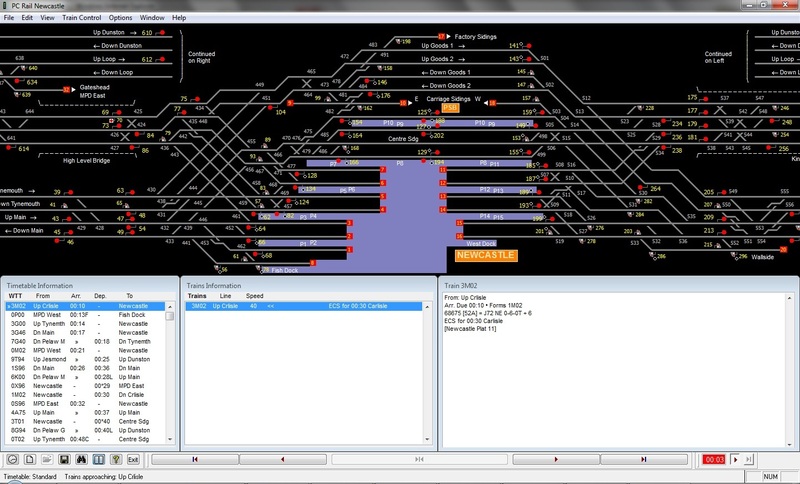 PC-Rail offers high quality railway signalling and operating simulations, so realistic that they are used within the railway industry for training. Never before has it been so easy to enter the fascinating world of railway operation! The simulations are highly interactive. Screen displays are continuously updated, allowing the user an ever-changing overview of the movements of all trains. Train speeds, acceleration and braking characteristics are authentically modelled. Each simulation puts the user in charge of a signal box or control centre at a busy location, responsible for the progress of trains, their routing and punctuality. There is a choice of skill levels and comprehensive Help is provided. Apart from providing many hours of pleasure and enjoyment, PC-Rail is an excellent way to learn and practise the most important skills involved in the operation of a real railway.